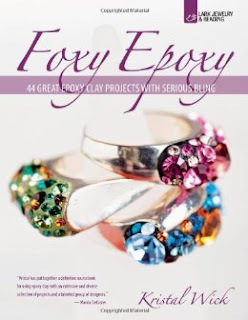 Have you had the opportunity to play with epoxy clay? I can guarantee that if you spend any time with Foxy Epoxy, the new Lark book by Kristal Wick, you won't be able to held back. So there...you've been warned! If you've worked with two-part epoxy resin before, you've already got the basic idea: mix the resin and the hardener together and pour. Except this is clay! So you will mold, moosh, squish, carve, and polish instead. And it adheres to practically everything (though not to silicone, which is convenient for mold making). I love the organization of the book; there are little thumbnail photos for project in the front so that you can easily find exactly the one you want to go back to. You'll find projects by Kristal and 12 other designers. Some are subtle and elegant, some are over-the-top bling. Something for everyone, in other words! 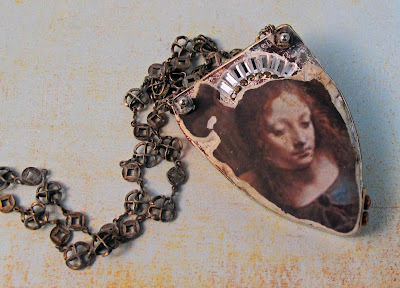 My very favorite projects are those by Debbi Simon where she teaches how to do image transfers onto epoxy clay. I also am very fond of Candie Cooper's "In the Round" earrings, where she mixes in wire mesh ribbon. So pretty! So unusual!